See full size imageWaterloo Bible College is an inter-denominational, evangelical, Christian college and seminary in Canada that is restoring the church to the New Testament pattern by holding the truth that the whole Bible is the inspired Word of God. Our purpose is to train new leadership for the 21st century church, community and world. Waterloo Bible College offers post-secondary, distance education, diploma programs to ECC clergy who wish to complete their ministerial education or enter ministry as pastors, teachers, evangelist, apostles and prophets in the work of ministry. Courses are offered to all believers who are serious about continuing their education. 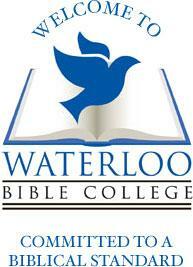 Waterloo Bible College was founded to make available affordable distance-learning diploma programs in higher education in the School of Christian theology.